This is Rachel from Jeremiah Middle School in a large urban school district in San Antonio, an admirer of your mad tech skills. Here’s the scoop: I am in need of a quick and fast mini-lesson on the topic of “flipped lessons.” The teachers are now being asked to compose several flipped lessons for the upcoming year. If you can tell me what information I may be able to instruct the staff on, it would be greatly appreciated. In a typical flipped classroom, students listen to pre-recorded video lectures beforeclass and perform other learning activities in class. In this flipped structure, students are exposed to material before class via videos and readings, and they attain deeper knowledge in class via activities. Why would you want to go to the trouble of doing flipped learning? Because the research says it works. I like to point folks to 10 Published Findings and Studies that offer qualitative and quantitative results in support of flipped learning, as well as Sophia Learning’s Flipped Classroom online course (free!). And keep in mind that flipped learning can work with students of any age. 2) Keep videos short, 5 to 10 minutes max (shorter is better). You can always create more videos. Think “bite-sized chunks” that students can nibble on their way to/from school, sitting somewhere waiting for an adult to do something, or during the gap in a basketball game on television or in person. 3) Figure out where the videos will be posted. This is THE MOST IMPORTANT question to get answered before you start encouraging teachers to start sharing flipped video lessons. If you’re using Google Apps for Education, you have unlimited storage. If you are using Microsoft OneDrive for Business/Schools (Office 365 through your district), then you have one terabyte of storage space. If you are using YouTube, no problem. 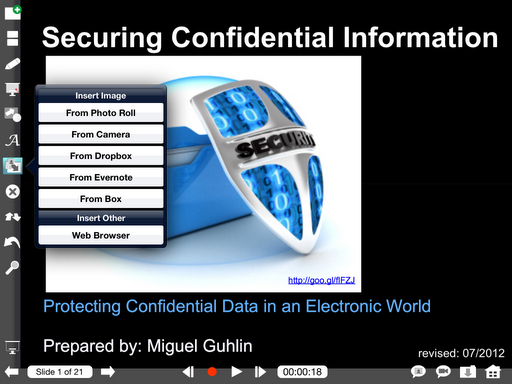 Video hosting is VERY important because it has to be accessible by both staff and students. 4) Plan for intensive classroom activities, and don’t be surprised if part of your class needs to watch the video in class (set up a pod of computers or devices where that can happen) while the rest of the students wrestle with a real life application of the flipped learning. In a hallway at the annual TCEA Convention & Exposition, you can learn a lot if you stop to chat with folks. One person that I met during the TCEA 2014 convention was Arden Curtis (@ardencurtis), a ninth grade biology teacher at the time. This was an off-the-cuff conversation that yielded quite a few insights into flipped learning. Be sure to listen to practitioners like Arden. Looking for some quick tools to get started? Microsoft Snip: If you are on a Windows computer, then give some serious consideration to Microsoft Snip, which allows you to snap a picture of your screen (e.g. a technical diagram, student work that needs feedback, whatever) and then record audio as you annotate it. To get an idea of how this works, play the short Snip I recorded . Windows/Mac Computer: TechSmith’s SnagIt+Camtasia Studio. I highly recommend SnagIt ($29.95), as well as Camtasia Studio ($179.90) if you need higher end video capture and editing. 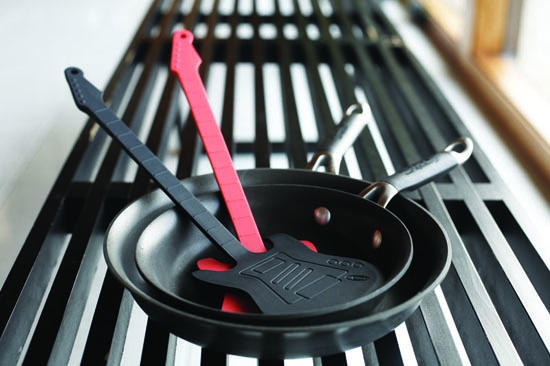 These are the tools that Arden, featured above, has used. Explain Everything Interactive Whiteboard. This is my must-have app on iOS devices. There is so much you can do with the app, yet it has a deceptively simple starting point for those unfamiliar. You can find tons of tutorials online. This app is available for Chromebooks, too. A different version of Explain Everything, known as the Collaborative Whiteboard, offers hosting for videos at a price. Touchcast. This free app makes green screen, flipped learning, video newsletters so easy. 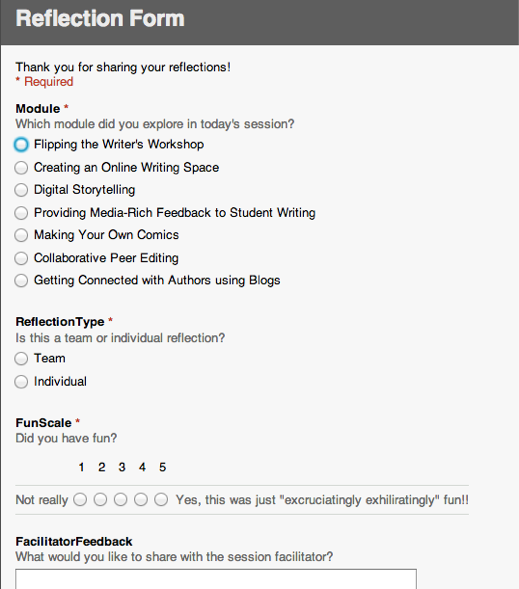 While it may be initially complex because of all the options, I have no doubt a short session and time spent watching others use it will get you ready to create flipped learning for your students. It is well worth learning all the bells and whistles in this app. Ample tutorials are available. Educreations. This free app has long been on the preferred list for teachers and students. Not only is it easy (view tutorial), but it solves the problem that many educators don’t want to deal with in their particular district: where to host the video created. Educreations will host content, of course, offering additional features at a price. Choose a screencasting tool that allows you to export directly to MP4 video format. This is the most commonly used video format and works with all devices. Anything else will just result in headaches. 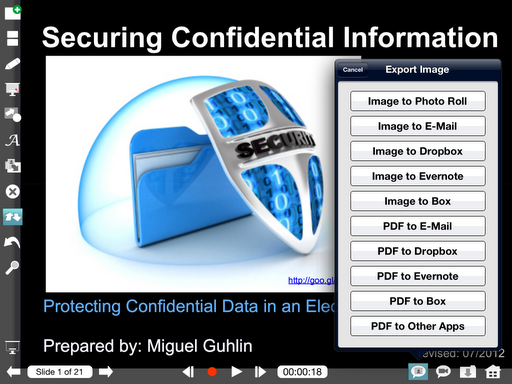 MS Snip, TechSmith’s SnagIt/Camtasia, ExplainEverything, and Touchcast allow you to do this without much fuss. The new HTML5 friendly video format is also known as WebM and you may need to convert from that format to MP4 to easily share the file with others. Nimbus Screencast and Screencastify are both Chromebook apps that will save to WebM. You may need to rely on a web-based video converter to get these videos to MP4 format, depending on where you host them. YouTube, though, will accept WebM format. Take advantage of video conversion tools like the cross-platform Miro Video Converter, FFMPEG GUI, and AnyVideoConverter, to get video the target “codec” you want or need. For a web-based converter you do not have to install (great for Chromebooks), use Online Video Converter. Decide ahead of time where you will publish your video. The best solutions include Google Apps for Education (GAFE) Drive since you have unlimited space, OneDrive for Business (Office 365), or YouTube. You can also set up your own video hosting solution or take advantage of one like Vimeo. But, wait, there’s more! Once you have your video recorded and ready for students to access online, you may want some way to determine if they have watched it. Mix in a Google Sheet Reflection with a Flubaroo feedback form that triggers when they submit something, an Excel Online Survey form that allows them to submit their reflections, or have them create something online, anywhere. Virtual spaces like Google Classrooms, Microsoft Classroom, Edmodo, Diigo Outliner (free for educators), and Sophia Learning all offer ways to help structure flipped learning content. You can also combine tools like OneNote with Microsoft Sway embedded in OneNote pages to create a virtual “closed space” or an open one, depending on what the culture of your teaching and learning environment. Whether it’s a piece of writing, a Vocaroo audio file they can send you the link to or a video reflection they can post on YouTube, flipped learning reflections can empower students to become consumers and creators of academic content. Today, we’re excited to take a first step toward achieving that goal by announcing an upcoming addition to our product lineup. We’re calling it Educreations Pro. Educreations Pro will not be free, but it will be affordable. While a free option will still be available, Educreations Pro will offer many powerful new capabilities. It will be available in two versions, a Classroom Edition and a School Edition. Educreations Pro will be available starting this summer, but we want to tell you about it now so you can begin planning to integrate it into your classroom next school year. In addition to photos, Educreations Pro will enable you to import documents, presentations, webpages and maps into your project. Educreations Pro works seamlessly with Dropbox and Google Drive, making it easy to open your files and get right to work. Save a copy of your video to your iPad, which you can post to YouTube, save to Dropbox or Google Drive, view offline, or use in other video projects. We know it can be challenging to finish an entire recording in a single session. The next version of Educreations will automatically save your work in-progress, so you can work on a project over multiple days. New whiteboard tools will enable you to draw lines and shapes, highlight important information, and focus attention on specific areas of the page. Create and manage classes right within the app. Students can join classes to view teacher lessons and collaborate on video projects with classmates. Teachers will enjoy a top-down view of all student work in one place. Some of my favorite options are included in the EduCreations Pro version, such as saving work in progress, the ability to import documents, cloud storage. My TOP favorite feature includes exporting to the Camera Roll of the iPad and Google Drive. offering a special discount on Educreations Pro to the first 100 schools that purchase the School Edition. I can’t help but wonder if the Pro features will be available to single users, as well. And, finally, still waiting for the Android version! One of the oft-asked questions this morning during the Build Your Virtual Classroom and the Create Online PD that Works was, How can I implement flipped classroom? 9th Grade Biology Teacher, Veteran Flipped Classroom Teacher!! In fact, Rhia Parramore (Winters ISD) asked me to share my insights and resources into flipped classroom, especially what software/apps are available. I’ve included my list below. Arden, who you can listen to in the podcast recorded above, shares that she uses ShowMe app on the iPad, as well as TechSmith’s Camtasia software. Touchcast (Free) – This is a tool to flip communications,create videos while reading a script right on the screen. Read this blog post to see examples. What else would you share with Rhea? Please share in the comments! 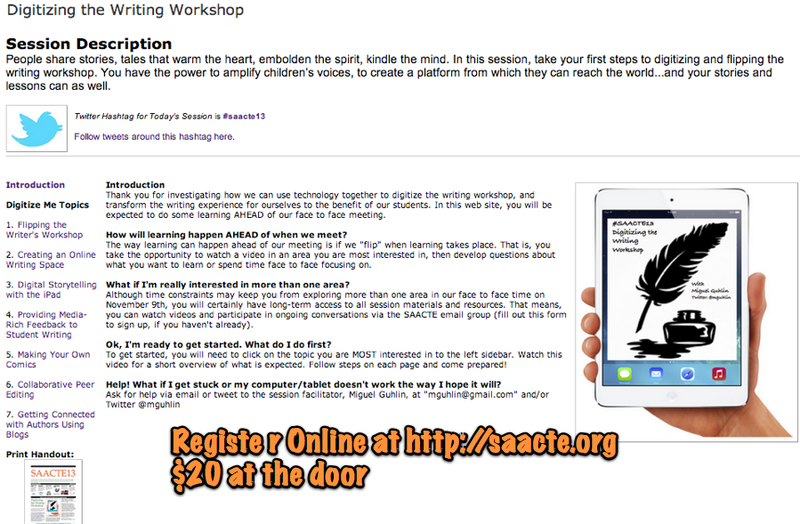 As I shared earlier, the SAACTE13 Workshop session (Saturday, November 9 in San Antonio, Texas for $20 at the door…register online at http://www.saacte.org) promises to be one of the most exciting workshops I have ever facilitated. I never would have tried this without Flipped Professional Development ideas in the back of my mind. The goal is to front-load the learning that would happen, typically in a keynote presentation that’s more how-to, hands-on, into a series of videos arranged around areas of high interest, such as Flipping the Writing Workshop or Creating an Online Writing Space, or Digital Storytelling with an iPad or Computer, and then planning out activities during the 1.5 hour time period. I am working on short slideshows made with Haiku Deck and/or Keynote depending on the topic. 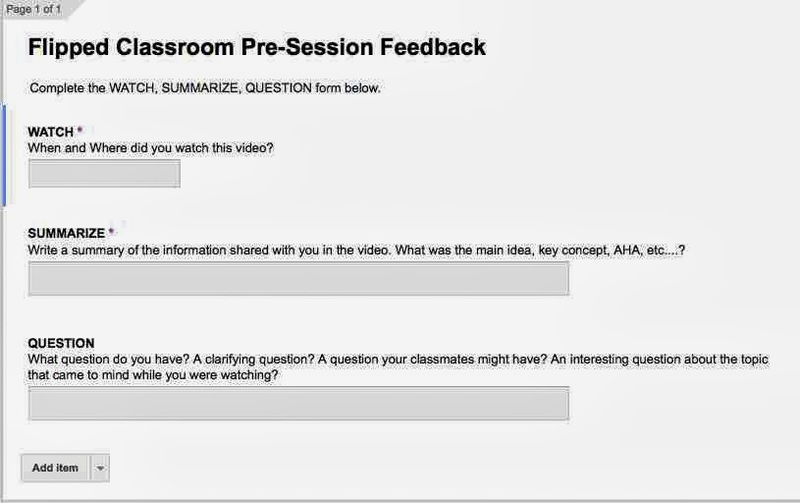 I’ll use the questions generated in the form to help people during the session, perhaps using FormEmailer to get easy feedback to each participant who asks the question. Participants who register ahead of schedule will have the choice of picking 1 of 7 different activities relevant to digitizing some aspect of the Writing Workshop. They can group together during the workshop session in small teams of 5 (or less) to work on a project. If everyone wants to do one mini-lesson, say Digital Storytelling, then that’s fine. The goal is to provide as much choice as possible to participants in the areas they feel they need the most support in when we’re together. One of the decisions I made in arranging how session participants will turn in their project creations is by using Evernote Notebooks. 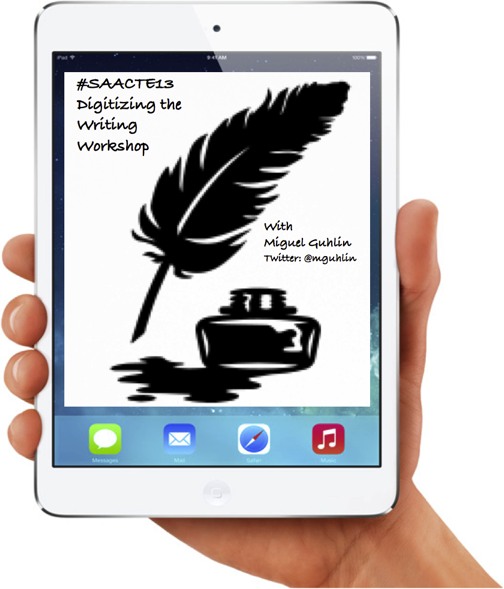 Participants will receive an email address (my top secret Evernote email address) and append @saacte13 to the email. 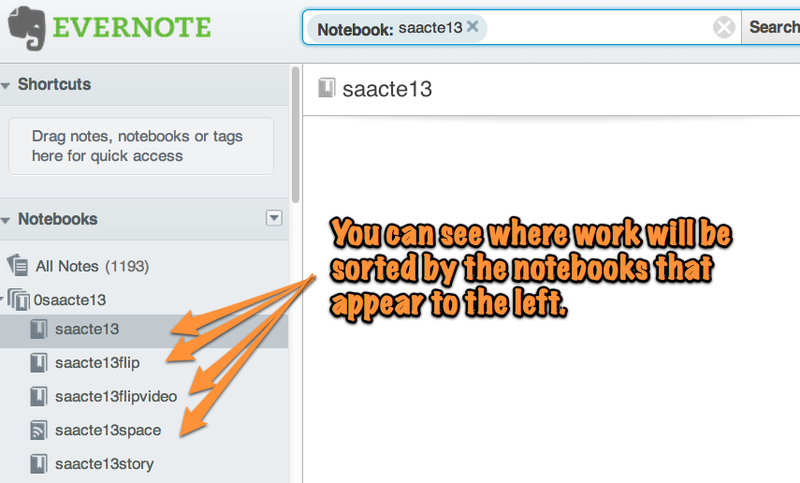 Of course, I have each activity going to its own notebook in Evernote. Again, this is the first time I’ve attempted FlippedPD at this level–with 7 preps!! !–so I’m hoping it all goes well. If you have suggestions or ideas, please don’t hesitate to share! A colleague recently shared the following link to Chris Lehman’s take on the Flipped Classroom, only to discover that it wasn’t that Chris Lehmann from the Science Leadership Academy and Practical Theory blog. @EricSchmidt: Innovation never comes from the established institutions. It’s always a graduate students or a crazy person or somebody with a great vision. Sal is that person in education in my view. He built a platform. If that platform works it could completely change education in America. I watched the video in question and didn’t find that quote objectionable. Does that make me a sub-standard educator? I believe people get stuck in ruts, and educators can find themselves welded into the infrastructure of status quo. It is my hope that tools like Khan Academy will help empower more and more students to understand that the tools are out there to teach themselves, but all of us have the moments where we need others to help us learn. If it accomplishes that, then Khan Academy will have done an incredible service in transforming education. But let’s never forget that — even in the best case scenario — once kids have learned the mechanics of the math that Khan explains, then they have to figure out how, when and why to use the math they learn. And I feel like Khan Academy does little to move us closer to that. For that, most kids will still – and always – need people (adults, fellow students, whomever) who will spend the time to help them make sense of their world. That’s a fascinating point of view. Khan’s videos only introduce one to the mechanics of math, while teaching is necessary to get at the how, when and why of what they are learning. It would be foolish to imagine that Khan’s videos alone could get the job done, unless the mechanics of learning are what schools today are about. There are lots of possibilities. . . . Note the annotation tools down the left-side, as well as the record buttons across the bottom. As I have shared in the past, I’ve been exploring how to best accomplish tasks that I would usually use a laptop or desktop computer with an iPad. One of those tasks includes creating narrated slideshows that can be used to illustrate a concept and/or share information. BTW, allow me to acknowledge Dr. Tim Tyson’s term, rough and ready quickcasts, which I stole from this blog entry. Thanks, Dr. Tyson! Teacher-created videos could easily be the creation of content done with an iPad with Internet access. In developing a narrated slideshow–imagine a Powerpoint slideshow with audio narration–I asked friend and education colleague, Wes Fryer (SpeedofCreativity.org) to share what HIS favorite slideshow narration tool is. 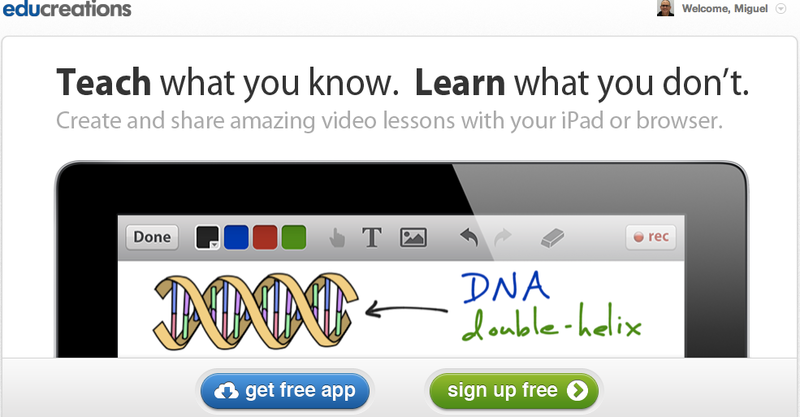 Annotate – allows you to draw arrows, squares, circle content as you are recording. 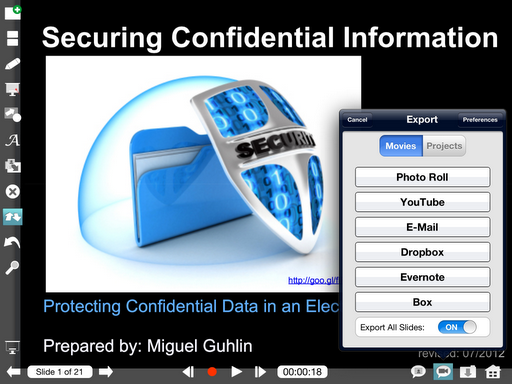 Record audio – This allows you to add audio narration per slide in the slideshow, treating each slide as different. Export the MOV movie that is created from your slideshow, audio, and annotations to various places, including the iPad itself (which is neat because then you can import that video into the Keynote ($9.99) iPad app). 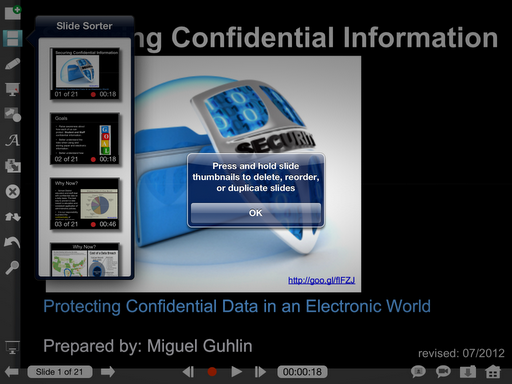 As you can see, with Explain Everything you can re-order slides, which can be handy on the fly! You can also insert images from various locations, which is invaluable given that the iPad often makes it difficult to share data from one app to another (it’s called sandboxing). You can export individual slides as images–especially useful after you’ve “written” or annotated them–out to various locations. And, of course, you can export the entire narrated slideshow to various places, including your own PhotoRoll on the iPad which means you can insert it into Keynote iPad app! What would make this export feature a real winner is export to WebDav, a feature that EC3 teachers and students will have access to! 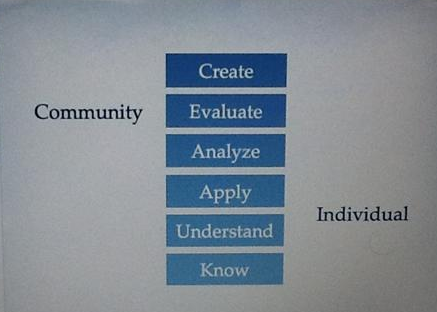 The instructional applications of a tool like Explain Everything are many. In the classroom, each student could create an image or representation of a concept, process, and then explain what’s happening. Each slide could represent a particular perspective or step in the process. I’m sure a lot more connections and possibilities are enabled by interactive whiteboards on iPads! 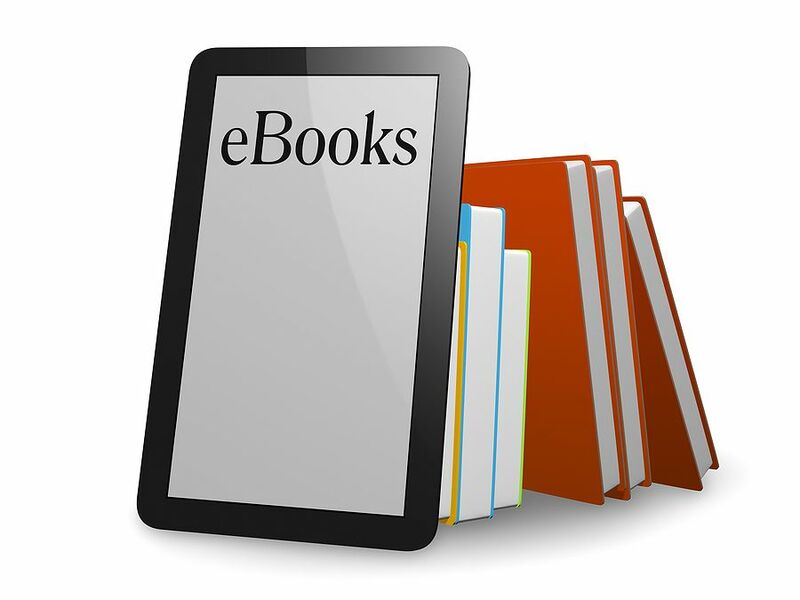 Two other iPad apps that are available at no-cost and could be used in lieu ofExplain Everything include 1) Educreations Interactive Whiteboard and 2)ShowMe Interactive Whiteboard. Although I didn’t spend much time with ShowMe Interactive Whiteboard since I found out about it last (and, of course, it’s the no-cost option), I did create a product with Educreations Interactive Whiteboard. Although one of the co-founders (Wade) said EduCreations can’t yet export your narrated slideshow as a video you can save on your iPad, it will allow you to upload it to their web site. Be sure to check out their showcase of lessons! By the way, if you’re interested in The Flipped Classroom, you’ll want to read my previous post on how to Flip Your Classroom with iPads! As you may recall, last week during the busy TCEA2012 Conference, I had a chance to participate in the ISTE SIGLIT Webinar organized by Barbara Bray. A recording of the webinar featuring Jason Kern and Ramsey Musallam–with a minor appearance by me (smile)–is now available! Stuartburt: @mguhlin Rural areas with low bandwidth such as Mount Pleasant, make it harder to have a flipped classroom. Some students have no access. Other tweets were shared but I can’t find them…they scrolled out of sight on my Twitter search…sigh. 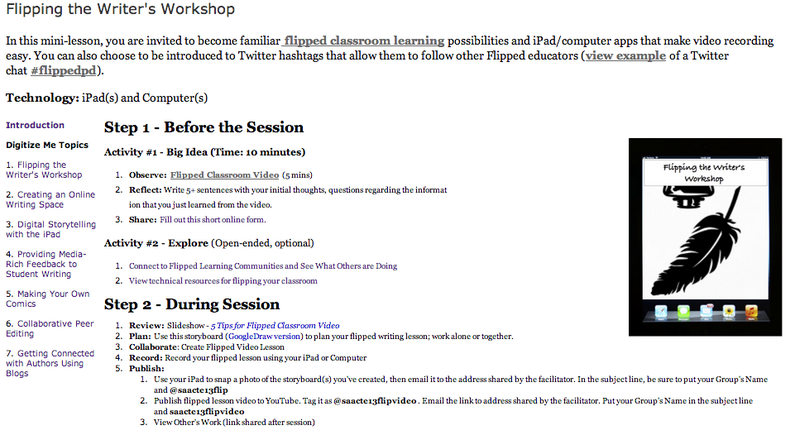 Another webinar on FlippedClassrooms that I found interesting included this one organized by Dr. Scott McLeod. 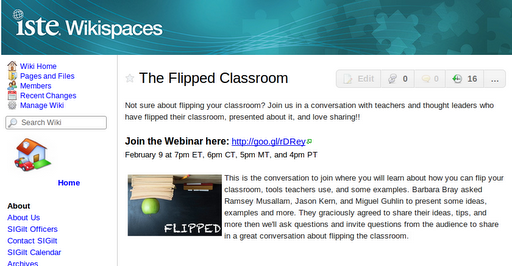 Are you going to be participating in The Flipped Classroom webinar being held at 6pm CST ? 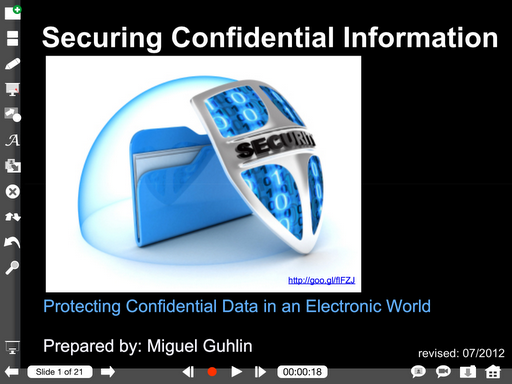 View more presentations from Miguel Guhlin. 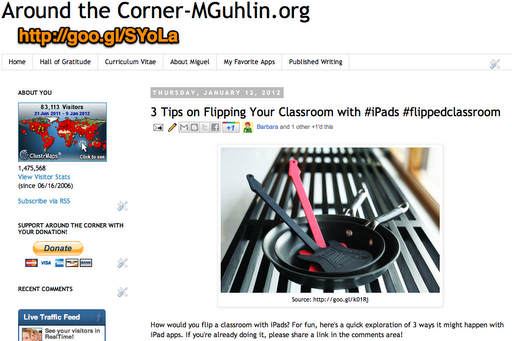 Not sure about flipping your classroom? Join us in a conversation with teachers and thought leaders who have flipped their classroom, presented about it, and love sharing!! This is the conversation to join where you will learn about how you can flip your classroom, tools teachers use, and some examples. Barbara Bray asked Ramsey Musallam, Jason Kern, and Miguel Guhlin to present some ideas, examples and more. They graciously agreed to share their ideas, tips, and more then we’ll ask questions and invite questions from the audience to share in a great conversation about flipping the classroom. Below is my “short” slideshow. As you will see, I tried to contrast the promise of the flipped classroom–that equips students with technology that is heavily based on video/audio going home with students–with the turbulent homes that low socio-economic students must navigate. Often, children come to school without clean clothes–lacking access to easy way to wash them–as well as school supplies, food, etc. The question I hope to leave us all pondering is, if you had $500 grants (about the same cost as iPads), children without basic necessities, how would you prepare them for the future? 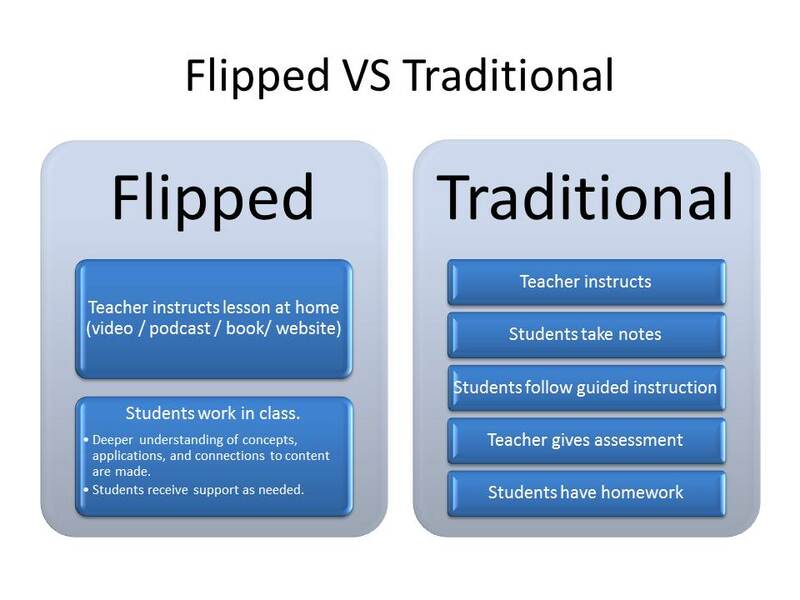 Not sure about flipping your classroom? 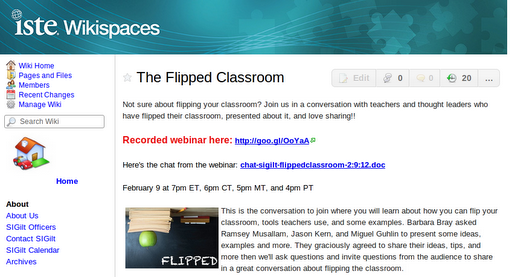 Join us in a conversation with teachers and teacher leaders who have flipped and love sharing!! This is the conversation to join where you will learn about how you can flip your classroom, tools teachers use, and some examples. Barbara Bray asked Ramsey Musallam, Jason Kern, and Miguel Guhlin to present some ideas, examples and more. They graciously agreed to share their ideas, tips, and more then we’ll invite questions from the audience to share in a great conversation about flipping the classroom. Ramsey Musallam (http://www.flipteaching.com)Ramsey is a high school chemistry teacher at Science Department Chairperson at Sacred Heart Cathedral Preparatory in downtown San Francisco, and an adjunct professor of education at the University of San Francisco. Ramsey’s doctoral research focused on the cognitive benefits of using sceencasting and tablet technology to help facilitate meaningful learning. Jason Kern (http://edtechemu.blogspot.com/2011/01/flipping-economics-classroom.html)Jason is the Director of Technology at The Oakridge School, a K-12 school in Arlington, TX (www.theoakridgeschool.org). He went back in the classroom to co-teach an economics class last spring to try out the flipped model. This is what the economics post and blog are about. 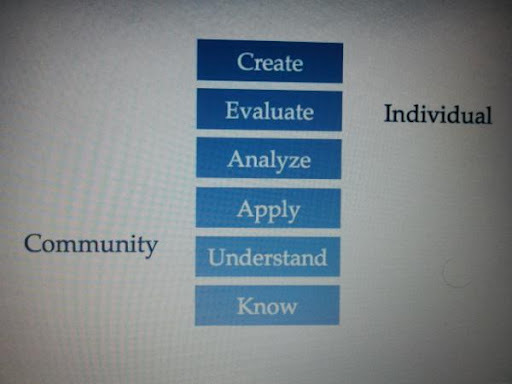 The class continues to use the flipped model so the blogs are current with this semester’s new students. They have also had several other teachers use the flipped model for appropriate units including middle and upper school science, math and foreign language. Jason thinks flipping is the best pedagogical tool to gain back valuable class time and allow teachers to spend more time doing hands-on learning. Miguel Guhlin (http://www.mguhlin.org/2012/01/3-tips-on-flipping-your-classroom-with.html)As Director of Instructional Technology for a large urban district in Texas, Past President of the state-wide TCEA Technology Education Coordinators group in one of the largest United States technology educator organizations, he continues to model the use of emerging technologies in schools. You can read his published writing, engage him in conversation via his blog at Around the Corner-MGuhlin.org. To be honest, I’m frightened to death of being a part of this conversation as a professional educator because I haven’t implemented “flipped classroom” methodology before. That fear aside, it wasn’t too difficult to imagine how iPads could fit into the Flipped Classroom vision, which is what caught Barbara’s attention. For fun, I’ve decided to explore The Flipped Classroom from a contrarian perspective, the first blog entry appearing today. I welcome your insights and opinions (including the, “You don’t know what you’re talking about! !”) since it illuminates the various points of view that exist about this. When Corlita left Seguin Elementary school, in her backpack she had something that was worth more than everything she had in her home, including the clothes on her back–an Apple iPad 3. Her teacher had put it in her hands, shown her how she could access the teacher videos on tomorrow’s lessons. Corlita couldn’t wait to get home, a corner of the Children’s Shelter set aside for children to do their homework. After dinner, she planned to snuggle up and watch the videos. As a 5th grader without access to television, watching her teacher talk would be just wonderful. After dinner, though, her Mom showed up to pick her up. In urban centers, children not only face poverty, but also high mobility between campuses in a school district, or school districts within their “home” city. Worse, turbulent home environments make learning at home an unstable proposition. Flipped classroom boast great results, but what about the poor, the homeless, who fight for a bite to eat in the night, trying to survive the chaos of parents unable to keep themselves, much less their children, in a stable environment conducive to learning? students can login to some online learning system to watch videos and chat with each other. As a parent of two children who have access to technology, I’m not sure I’m prepare to have them come up to be “introduced” to hard-hitting, advanced placement content absent a teacher. Even though we’ve seen students moving online to access content, everyone knows the interaction is where learning happens. But absent a teacher, how is interaction in some online learning system enabling grade 3-12 students to learn? How do students build the discipline to learn on their own in turbulent home environments? How would you flip a classroom with iPads? For fun, here’s a quick exploration of 3 ways it might happen with iPad apps. If you’re already doing it, please share a link in the comments area! EdLab’s Misconceptions about the Flipped Classroom Model:The Flipped Classroom model is the shifting of the classroom paradigm, so that lectures can be seen at home, while homework activities are done in class. This is to allow more time for applying the knowledge and receiving more personal help from the educator. …teachers say flipped, or upside-down, classes offer greater control of material and more face time with students. In many cases, software allows students to chat online while watching the videos. Tegrity, a Silicon Valley firm that specializes in flipped instruction, allows students to time-stamp lecture notes. It boasts more than 1million student users, many of them in higher education. The flipped classroom is all about “making connections with learners and differentiating your instruction.” Therefore, a teacher can have such a classroom as long as the needs of all learners are being met. Bennett is commended for meeting the needs of his learners. However, for a classroom to truly be “flipped,” prepared instruction must continue at home, not just in the classroom…what matters are “the relationships, the discussions, and the experiences,” then the flipped classroom provides an effective use of classroom time to build relationships, engage in serious discussions, and provide meaningful experiences for all learners. 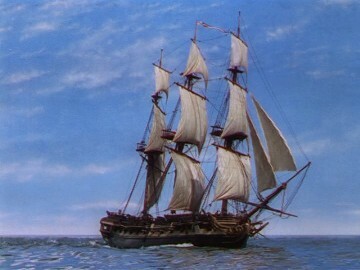 And let’s not forget one more advantage. The flipped classroom allows more time for student interaction with the teacher. The disadvantage comes when a student does not have access to the technology — an iPad or the Internet to watch instructional apps or videos. Dangerously Irrelevant’s The ‘flipped classroom’ webinarDespite its now-famous Dan-Pink-sponsored affiliation with our esteemed colleague, Karl Fisch, is the ‘flipped classroom’ a true innovation or just a new label on the old stale wine of lectures? Is it something we should be encouraging or discouraging? If it has benefits, are they worth the accompanying drawbacks? American Public Media’s Rethinking the Way College Students Are TaughtResearch conducted over the past few decades shows it’s impossible for students to take in and process all the information presented during a typical lecture, and yet this is one of the primary ways college students are taught, particularly in introductory courses…Here’s how he does it [peer instruction]: Before each class, students are assigned reading in the textbook. Pretty standard for a lecture class, but if you talk to college students you’ll find that many of them don’t bother with the reading ahead of time. They come to class to figure out what information the professor thinks is important, then they go to the textbook to read up on what they didn’t understand. He expects students to familiarize themselves with the information beforehand so that class time can be spent helping them understand what the information means. 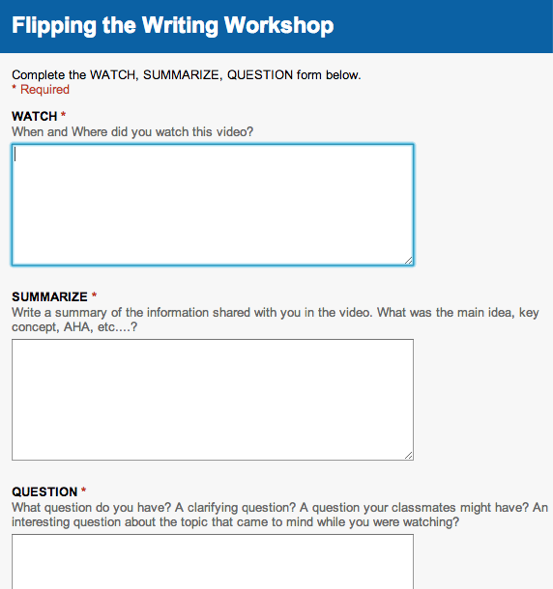 Edudemic’s How a Flipped Classroom WorksMy thinking was, if I flipped the classroom, and provided the instructional/demonstration part of the course material as a series of video tutorials, that students could then work at their own pace, on their own time, to learn the software, rewinding, fast forwarding and repeating the lessons as needed – and apply what they’d learned as their homework during class time instead. You can imagine that lots of folks are giving the idea of a “flipped classroom” some serious scrutiny. I won’t bother going into the reasons why some folks–I have no opinion on the matter yet, except to say I’m intrigued and would like to try it out in one of my workshops–are not supportive of flipped classroom approaches/ideology, etc. The question going around in my head is, what kind of technologies can be used to support a flipped classroom? 1) An easy way to record video/audio/screencasts and make those available to students, even when they are not connected to the Internet. Recording video/audio doesn’t seem to be too difficult with iPads. The problem is making them quickly available to others, especially students in this scenario, without having everyone sync their iPads to iTunes. How can students access newly created content residing on one computer in the classroom and then save it to their iPads? The solution is obvious–AirPlay It, a free server and iPad/iOS/Android app that makes it easy to either stream video/audio or save it onto your device. As you might imagine, recording video/audio with an iPad isn’t necessary in an environment where you can take full advantage of a video camera or digital audio recorder, drop the file on a computer with AirPlayIt Server installed, then students with iPads running the app can install. However, there’s no reason why you need limit yourself and NOT create video with an iPad (or pay $.99 for Wes Fryer’s tutorial!). Or, you can also use an app like Qik–although this may not be a free option for long–to record video and broadcast it. If your focus is on audio, then the free Dragon Dictation may be better suited to your needs. Record your audio, then stream it. 2) A way for students to process information and ideas, taking notes on what they are learning as they’re exploring a topic or “meeting a problem” for the first time. What technology could be used to help students take notes on what they are learning? Obviously, EverNote (free) and Notability ($.99) come to mind. If you’re not familiar with EverNote–have you seen John Larkin’s Evernote Workshop handout? Really neat!–there’s a lot to love and encourage students to use. EverNote provides a lot of value for free, but you can tap into a lot more if you pay. Notability is an alternative…I haven’t played with it since I can’t afford it (I’m on a free iPad app account), but it’s definitely worth introducing to students if you’re going to invest. Again, the idea of providing a virtual space students can use to explore a topic, share what they are thinking is critical in learning and has to be modeled. 3) How could you use technology to deepen the relationships, discussions and the experiences students are going through? There are a lot of traditional solutions–whether it’s Edmodo (which has an iPad app) joining GoogleApps for Education in February, 2012 or MyMoodle–there are increasing choices that can help students deepen the learning conversations taking place. Whew, that was harder than I thought it would be. 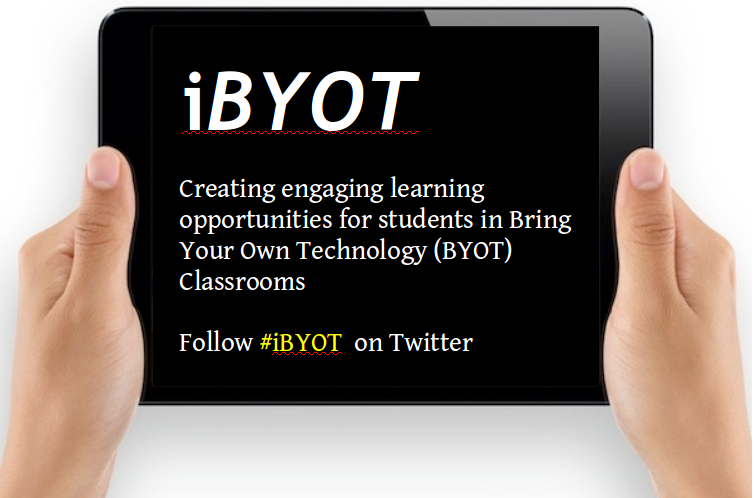 How do you see iPad fitting into the flipped classroom? 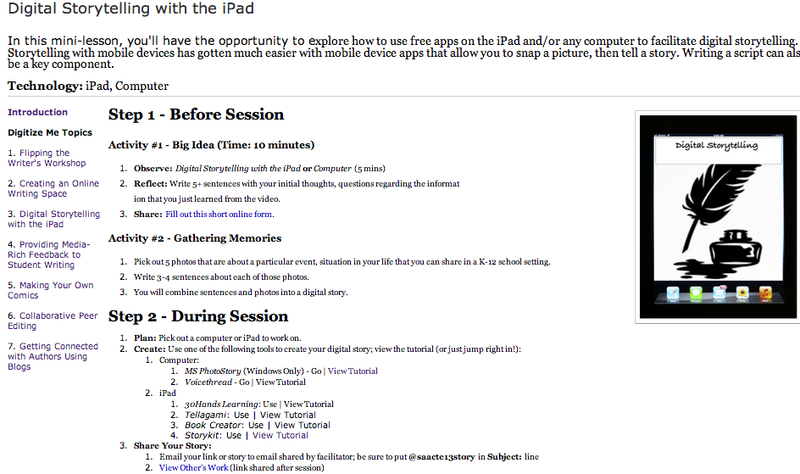 Read more about iPad stuff in schools….